We talk a lot about the sea lions and their antics. But they're not the only youngsters! 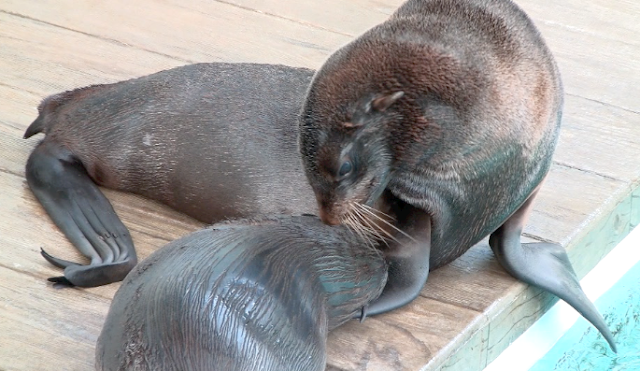 Leu (the Northern fur seal pup rescued earlier this year) and Flaherty (the pup born to Ursula in July) are growing up and testing out their new-found strength on the deck and in the water. Play is an important part of an active lifestyle. Sometimes it means being on a sports team, sometimes it means just kicking the ball around with a friend. If you're a fur seal, it means rough housing, pretending you're an adult male fur seal protecting your territory. For Leu and Flaherty, play continues until they get tired or Flaherty's mom, Ursula, breaks things up (as you saw in the video). He's is still a baby protected under her watchful eye. But Flaherty's growing fast. If you want to see this little guy before he grows to be as big as his dad Isaac, you better come visit the New Balance Foundation Marine Mammal Center!